(CNN) - Texas Gov. Rick Perry has been courting gun manufacturers in states that have enacted tougher gun laws, and next week, he's taking his message on the road. Perry will travel to Connecticut and New York to meet with business leaders in the firearm industries, his office announced. Before Perry’s four-day trip, a public-private group called TexasOne began running two television commercials in both states on Monday, touting Texas as a welcoming climate for gun manufacturers. The campaign emphasizes that Texas levies no state income tax, while the state income tax in New York can range from 4% to 8.8%. The $1 million ad buy will run for one week, and Perry's office said no state tax dollars will be used for the trip or the advertising. Perry made a similar scouting trip to California earlier this year after an ad campaign to draw business from the state, but his focus wasn't on gun makers. Shortly after Connecticut passed a package of stricter gun laws in April, PTR Industries of Bristol said that it planned on leaving the state by the end of summer. Colt Manufacturing, located in West Hartford, has also expressed concerns. "Our first choice is to continue to work and build here," CEO Dennis Veilleux told CNN's Wayne Drash. "But our customers will not buy our products made and distributed from a state that doesn't respect their Second Amendment rights." Connecticut’s law adds more than 100 guns to the state's list of banned assault weapons and limits the sale or purchase of high-capacity magazines like those used in the Newtown school shooting in December that left 20 children and six adults dead. It also requires background checks for all gun purchases. Democratic Gov. Dan Malloy drew scorn from the gun industry when he chastised the NRA for inciting paranoia. "What this is about is the ability of the gun industry to sell as many guns to as many people as possible - even if they're deranged, mentally ill, a criminal background, they don't care. They want to sell guns," Malloy said in April on CNN's "State of the Union." He said gun manufacturers were welcome to stay in the state. "But you know what," he added, "we've decided that the public's safety, that schoolchildren's safety, that schoolteachers’ safety, trumps all of that." New York, also home to gun manufacturers such as Remington Arms, in January became the first state to pass stricter firearms legislation after the Newtown shooting. In his speech at the National Rifle Association convention last month in Houston, Perry made known his interest in the blue states’ businesses, inviting them to move to Texas to avoid such "draconian laws." "We'll happily welcome any gun manufacturer who feels vilified and any of their employees who are in danger of losing their livelihoods due to this kind of hysteria," he said. "There's still a place that loves freedom in America, where people can pursue their dreams free from knee-jerk government regulation. That place is called Texas!" A month earlier, he had made a direct pitch to PTR. Perry faces re-election next year but has not yet announced whether he'll seek another term. - CNN’s Greg Botelho contributed to this report. That's one way to "claim" jobs increasing in your state. Maybe Scott Walker is going to try it too. Just think if Perry gets his wish all the new immigrents will have jobs assembling S&W,Colts and anything else that resembles a firearm..And guess what people they'll get paid minimum wages while charging you sky high prices,nothing changes but the quality that's all! !Maybe Texas will outsource the governors job because the way it keeps going the busiest place will be the welcome shop across Americas border with Mexico thanks to Perry!! What. An. Idiot. He makes me cringe every time he opens his mouth. Not all Texans are like Perry, believe me! There are actually intelligent people in this state, but you'd never know it by listening to our governor. I hope he runs for president; then maybe we can elect someone with some sense to Austin, and you can bet your boots Perry won't ever make it to the White House! So Perry doesn't create jobs, he steals them. Typical republican fraud! Most of the objection to the media push for gun control was based on the fact that it was an emotionally driven cause. That removed the reason from the debate, and nothing was accomplished. This is just a guy trying to get more jobs for the people in his state. Relax. If one quarter of the people in this country are *mentally ill* then illness should be defined and treated before guns become restricted. How do you begin screening for illness without definitions? Do you really want to go to a state where the percentage of those with health care is low as are the test scores? good move perry! why should manufacturers continue to pay taxes to states that are constantly attacking them and trying to run them out of business? This is a face that could be described as pure evil. This man, and those responsible for his elevation to power, seem to have one agenda. Place as many weapons as possible in the hands of people, regardless of the mental capacity of the person holding the gun. What have these people got against the rest of the nation, that they invite carnage whenever possible? Wow a governor doing his job???? Funny when that makes news. Well at least he knows what his calling is. Gun salesman, not President, rock on ricky. Rick Perry tries to lure Fertilizer plants to Texas ? Texas Gov. 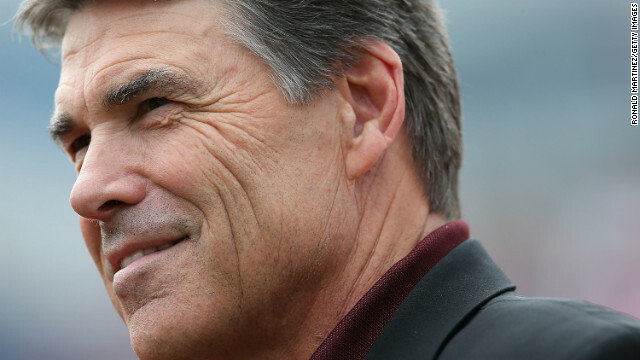 Rick Perry has been courting fertilizer plants from other states to move to Texas . Five days after an explosion at a fertilizer plant leveled a wide swath of this town, Gov. Rick Perry tried to woo Illinois business officials by trumpeting his state’s low taxes and limited regulations. Asked about the disaster, Mr. Perry responded that more government intervention and increased spending on safety inspections would not have prevented what has become one of the nation’s worst industrial accidents in decades. Gun Safety is using both hands ! And rightfully so. If you don't like the product, then you can't share in the revenue. I hope they all move to Texas. And if you're prepared to make a very large and very quiet donation to gov. Oops, the rent is very reasonable! This guy sound like he is smoking gun powder. I have been wondering why this oops guy photos are usually of the area below his belt (since cnn gets upset when I use the correct word – starts with a c ends with h) but now I know. He needs a gun to make up for what's little and useless below the belt. Doesn't Texas have the worst record regarding safety at the workplace? Very pathetic idiot. Better move out of that idiotic state. "There's still a place that loves freedom in America, where people can pursue their dreams free from knee-jerk government regulation. " Freedom to slaughter 26 people in a elementary school? Free to gun down anyone randomly walking by? Pursue their dreams and having a massive pile stock of lethal weapons in their house that their children can access and shoot their siblings with? America is a sick place.